The Library plugin of Fedena manages your institute’s library by providing login access to students and teachers to search for available books and order them from anywhere and anytime. All they need is internet. But for this module to work in full efficiency, you need to have all the library details stored in Fedena. 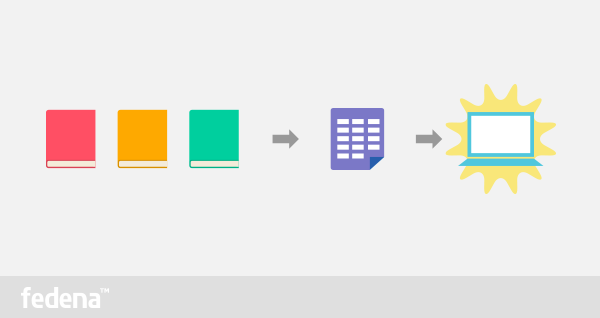 You can import your book list in bulk to your Fedena by using the magical custom import plugin, this article reveals the steps on how to do it. Step 1: Open your Fedena account and go to ‘More’ and then to ‘Custom Import’. You need to create a ‘New’ import. Step 2: Once you click on ‘New’, you get a page where you need to fill in some details. Here, we have created a new export and have selected ‘Model’ as ‘Library Book’. ‘Associated Data’ includes tags that you want your books to be associated with and in the ‘Book additional detail’ you can store information like the date of purchase, price, etc. Step 3: Export the CSV spreadsheet where you need to store all the detail about the books in the library. Once you are done with storing, you can upload the spreadsheet by clicking on ‘Import Data’ which allows you to upload a complete spreadsheet to Fedena. You can have customized ‘Book additional detail’ for which you need to go to ‘Dashboard’ and then to ‘Library’. In ‘Library’, you get the option of ‘Manage Book Additional Detail’ where you can create your own additional detail options and have your own customized book additional details. Fedena student information system comes with many easy to use features and plugins. Click here for more expert tips.